It takes real boldness to venture into the goth metal and rock genre these days. The field is packed with players stumbling over each other hoping to become the next Nightwish or Within Temptation. It takes even more balls to present your band and your debut work by displaying your hot looking chick singer on the cover (not that it hasn't been done before). It's a good thing that Aya is a better than average singer. Yet this is what Maurycy "Mauser" Stefanowicz (guitarist, ex-Vader) has chosen to pursue in hopes of establishing an new career for himself. And frankly, 'The End Of Life,' though often deriative, is a better than average creation. Additionally, and thankfully, another postive aspect of 'The End Of Life,' is that UnSun has chosen NOT to mix dirty/death vocals into the vocal arrangements. Now that defies current conventions and gives them immediate credibility in my book. On the downside, the one single thing that troubled me throughout 'The End Of Life' was the guitar solos. As regular readers, you know how much I love lead guitar, so you're probably thinking that this must be something truly serious. I'm not sure myself. As I listened to 'Lost Innocence,' 'Blinded By Hatred' and some others, the solos, though excellent and rousing, seemed unnatural as if they were an afterthough added later. My son put it well after listening to 'Blinded:' 'It sounds like somebody said, 'Hey, we need to put a guitar solo in here some where.' On the other hand, the guitar solo seems more natural, more part of the song, on 'Face The Truth.' In the end, I still liked Mauser's fret work. I found UnSun's 'The End Of Life' to be interesting and entertaining even though they are often deriative especially when following the goth genre. Their real strengths are in Aya's ungoth vocals, Mauser's guitar solos, and the nearness to melodic hard rock and metal in their compositions. 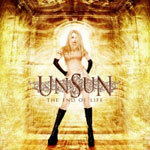 I found UnSun's 'The End Of Life' to be interesting and entertaining even though they are often deriative especially when following the goth genre. Their real strengths are in Aya's ungoth vocals, Mauser's guitar solos, and the nearness to melodic hard rock and metal in theri compositions.